Remember, back in the day, it was all so much easier! Publishing seemed black and white – either you could convince a publisher to take your book, or not. Your percentage chance of success were low, but we all knew that. Your percentage chance of ever making any money were even lower – but although we all knew that too, we ignored it. Dream on – it’s the only way! Now of course, it has always been possible to ” go it alone”. Way back when publishing first started, all books were “self published” – because the printer/publisher/author were the same people. That soon changed, and clear blue water – some might say a giant wall – appeared between the lonely author and the means of getting the words out to readers. Let’s give the benefit of the doubt to the industry, and say this wall is there to ensure that only the best quality gets into the minds of the public, and appears on the shelves of our book stores and libraries. But as we all know, things have changed again. Technology, the web and the digitisation of all things have conspired to open up the world of publishing to all. Surely a great thing? Surely the democratisation of content, and knocking down the artificial wall between the author and the reader is good for all? That gets me to the real point of this post. I chose to “self publish” my first book, The Knitter. I did that for some well thought through reasons, including ensuring my own personal vision for what is a very personal book reached the page, wanting to test the market before putting my efforts into finding a publisher, and wanting to focus on the writing and not on the attempt to “get published” (both full time jobs!). The Knitter is my first book, so like all good honest tech literate wannabe authors, I scoured the blogs, web sites and any other outlets I could find for all of those gurus, know-alls and battle hardened creatives, so I could learn from their combined wisdom. Now – there is plenty of good advice out there, and it’s needed; getting your masterpiece read may have become a lot easier, but it has also become a lot more complex with more choice than most of us want to be faced with. And choice and complexity always bring with them shysters, all eager and willing to help. Vanity publishing is a pejorative term, referring to a publisher contracting with authors regardless of the quality and marketability of their work. They appeal to the writer’s vanity and desire to become a published author, and make the majority of their money from fees rather than from sales. The author pays all of the cost of publication and undertakes all of the risk. In his guide How to Publish Yourself author Peter Finch states that such presses are “to be avoided at all costs.” Because there is no independent entity making a judgment about their quality… vanity press works are often perceived as deserving skepticism from distributors, retailers, or readers. Some writers knowingly and willingly enter into such deals, placing more importance on getting their work published than on profiting from it. Authors normally retain all rights to the material, and the books printed are owned by the author. A subsidy publisher distributes books under its own imprint, and is therefore selective in deciding which books to publish. Subsidy publishers, like vanity publishers, take payment from the author to print and bind a book, but contribute a portion of the cost as well as adjunct services such as editing, distribution, warehousing, and some degree of marketing. As with commercial publishers, the books are owned by the publisher and remain in the publisher’s possession, with authors receiving royalties for any copies that are sold. Most subsidy publishers also keep a portion of the rights from any book that they publish. Generally, authors have little control over production aspects such as cover design. “True” self-publishing means authors undertake the entire cost of publication themselves, and handle all marketing, distribution, storage, etc. All rights remain with the author, the completed books are the writer’s property, and the writer gets all the proceeds of sales. Self-publishing can be more cost-effective than vanity or subsidy publishing and can result in a much higher-quality product, because authors can put every aspect of the process out to bid rather than accepting a preset package of services. Short run printing is also called Print-on-demand (POD) or Print Quantity Needed (PQN). Many major publishers use POD printing to produce small quantities of older titles, or to produce galleys for sending out to book reviewers and sales reps. Some innovative publishers are now using this technology to print initial orders for a new book until marketplace demand can be ascertained. It is now common to see the technology used for vanity and subsidy press operations—often referred to as POD publishers. POD publishers generally do not screen submissions prior to publication, and many are web-based. They accept uploaded digital content as Microsoft Word documents, text files, HTML or RTF files, as printing services for anyone who is willing to pay Authors choose from a selection of packages, or design a unique printing package that meets their requirements. Many critics dismiss POD as another type of vanity press. One major difference is that POD publishers have a connection to retail outlets like Amazon and Books in Print that vanity presses generally do not. Although these definitions may be broadly accurate, they hide the real flexibility prospective authors have today. Too many commentators still appear to treat the world as being neatly split into strict categories like these, when in fact the distinctions are being constantly blurred. Take my case – I chose to publish through Authorhouse – knowing it probably wasn’t the cheapest option for me; but it suited me, with no publishing background, to deal with a one-stop-shop that gave me the flexibility I wanted. 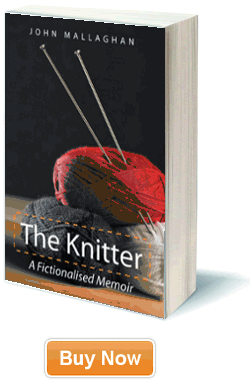 The Knitter is available from them, POD and e-book. It’s also on Amazon and pretty much everywhere else, and most important to me it is also available from my own web site. I own full rights to the book, and if my master plan works out, I will move to using a “traditional” publisher when I have proven I have a book that sells. So which publishing bucket do Authorhouse fall in to? They are not a traditional publisher, but as many as 1 in 20 books sold in the US come from them! They charge the author for their services, so are the a “vanity publisher”? Are they a POD publisher? Are they even a “publisher”? The definitions are becoming a block in themselves. Authorhouse were in my case the right choice to get my masterpiece out to an unsuspecting world. I may start a campaign to have the terms “vanity publisher” and “True self publishing” wiped from the vocabulary. There is nothing “true” about doing it all yourself. There is potentially something cheaper and more satisfying, but it does not result in something better. Never forget, the only important element of this whole thing is the quality of the book you are trying to publish. If you lose sight of that – if the process becomes more important to you – you will almost certainly fail. Vanity is in the mind, not in the process. I’d have to okay with you one this subject. Which is not something I typically do! I enjoy reading a post that will make people think. Also, thanks for allowing me to comment! I am impressed, I have to say. Very seldom do I discover a blog that is both educative and entertaining, and let me tell you, you’ve hit the nail on the head. Your opinion is important; the issue is something that not many people are talking intelligently about. I’m really happy that I stumbled across this in my search for something relating to it. 2011 Happy New Year! As a Rookie, I am continually checking on the internet for articles which can easily help me. But do you know the reason why i can’t see all the pictures on your web page? Good publish, adding this to my own blog right now, thanks. You ought to essentially take into consideration working on creating this weblog into a major authority on this market. You evidently have a grasp handle of the topics everyone seems to be searching for on this web site anyhow and you possibly can actually even earn a buck or two off of some advertisements. I might explore following latest subjects and elevating the amount of write ups you place up and I assure you’d start seeing some superb targeted visitors in the close to future. Only a thought, good luck in no matter you do! Yes! Nice writing, continue to keep up the wonderful job. That is the kind of material that basically ought to achieve acknowledgement pertaining to it’s art. More internet writers should study from you. This is exactly on the money. Previous post: E-Books + Kindle + Sony E-Reader + iPAD = The death of books?